Spinal Epidural Inflammatory Pseudotumor : A rare case report of histo pathologically proven spinal epidural inflammatory pseudotumor in dorsal region. A 50 yo male with presented with urinary incontinence and progressive bilateral lower limb weakness. n associated dull pain for last 4 months localized in mid dorsal region along mid line. Hb, white blood cell count, ESR, C-reactive protein level, Liver function test normal. This MRI study shows:A focal posterior epidural lentiform shaped soft tissue signal intensity with homogenous enhancement on post contrast T1w images. The soft tissue is encasing exiting nerve roots at this level on either side. 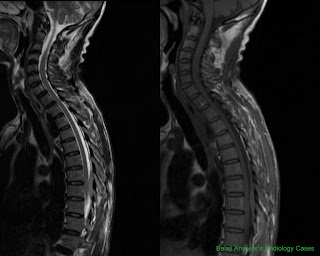 An associated para spinal soft tissue on left side. Imaging wise possible DDs given were: Lymphoma, Metastasis, Pseudotumur. Posterior decompressive laminectomy performed. Histopathology revealed diagnosis of Inflammatory pseudotumour. Syn : Inflammatory myofibroblastic tumor. A benign tumor like lesion of unknown cause, which has been described in very small numbers at various locations throughout the body. It is believed that inflammatory pseudotumor is an inflammatory process that includes a diverse group of lesions characterized by inflammatory cell infiltration and variable fibrotic responses. IP is a chronic inflammatory tumefaction of unknown origin characterized by proliferation of myofibroblastic spindle cells with mixed inflammatory infiltrates of plasma cells, lymphocytes, Eosinophils, and histiocytes. IP is found in the lung and occasionally in the mouth, gastrointestinal tract, thyroid gland, kidney, lymph nodes, and skin. The pathogenesis of IP remains a matter of debate. Some cases have been associated with malignancy or tuberculosis as satellite lesions. The multiplicity of sites that can be involved suggests no particular route of entry or any specific agents. Prior surgery, trauma, or immune disturbances, in addition to infection are included for the possible etiology. IP has no distinguishing characteristics, either clinically or radiologically. Hence, the diagnosis of inflammatory pseudotumor can be made only after other specific disorders are ruled out. 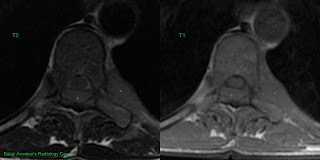 MRI with contrast is considered as investigation of choice. Signals on MRI varies, hypointense to iso intense on T1 and hyper intense to hypo intense on T2w images. Enhancement pattern is often intense and homogenous. 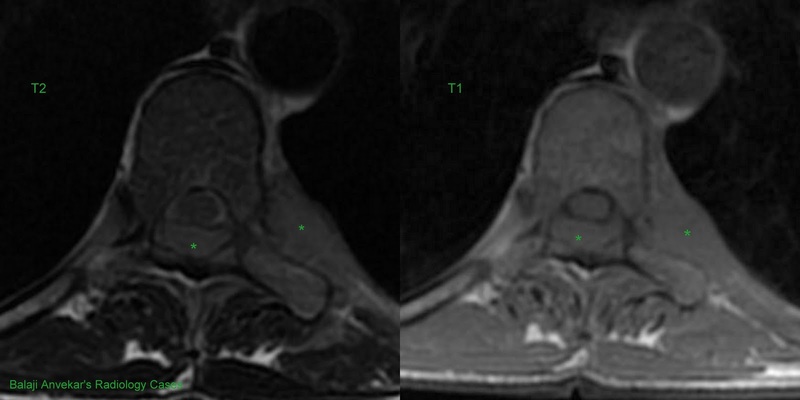 Despite the limited number of cases, low signal intensity on T1 and T2-weighted images with homogenous strong enhancement on post contrast are considered as characteristic findings of Pseudotumor on MRI. Low signal intensity on T2 weighted images explained by a relative lack of both free water and mobile protons within fibrotic lesions of this fibrosing inflammatory pseudotumor. the lesion is very difficult. IP has been treated with surgical removal and steroid therapy with good results. Reference : Inflammatory Pseudotumor in the Epidural Space of the Thoracic Spine: A Case Report and Literature Review of MR Imaging Findings; Ho Jun Seol, Sam Soo Kim, Ji Eun Kim; AJNR Am J Neuroradiol 26:2667–2670, November/December 2005.